With about 30 eisa organizations, the participants of the 10,000 Eisa Dance Parade performed vigorous eisa dance in Naha on August 3. 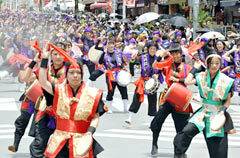 Ten Thousand Eisa Dance Parade was held in the 20th Summer Festival on Kokusai Street in Naha. With great vigour and energy, the participants performed Okinawan traditional performing arts such as eisa dance and creative dance on the road. The crowd of spectators enjoyed it. Celebrating the summer season, the sound of the drums echoed on the street under blue skies. About 30 eisa organizations as well as eisa groups which unofficially took part in the festival, and local youth associations performed eisa while parading through 10 locations from Saion Square in Asato to Palette-Kumoji. Supporters of eisa performers sprinkled water on drummers at each performing location to prevent heat stress disorder.